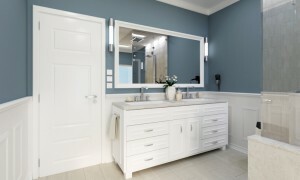 A bathroom remodeling project offers the perfect opportunity to create a bathroom that truly meets all of your needs. From providing more space where you need it to finally upgrading your tiny tub to the iron clawfoot tub of your dreams, a bathroom remodel is the right time to get creative and think about what you truly want out of your bathroom. For a few fun ideas, we’ve rounded up a few bathroom remodeling trends that you’ll see a whole lot more of in 2016. Learn more in today’s blog! These bathroom remodel design trends will get you inspired! There was a time that low-flow showerheads were all the rage and were the newest and most exciting innovation to hit the market in years. Now that these showerheads have become routine, savvy remodelers are looking for other exciting innovations to incorporate into their remodels and high-tech showers are filling that need. These can be “smart” showerheads which connect to lighting and sound systems and allow you to illuminate your bathroom with brightly colored LEDs or control your bluetooth speaker’s volume directly from the comfort of your shower! In 2016, bathroom remodelers will be paying more attention to the sinks they choose. Undermounted sinks have been gaining popularity over the past few years and that’s not likely to change anytime soon. Trough sinks are also becoming increasingly popular as they offer a lot of space in a sleek and modern package. Often also referred to as a “double sink,” trough sinks are the perfect option for families with toddlers who tend to make a mess when washing their hands or anyone who likes a little bit more room while they wash up. Another increasingly popular bathroom remodel design trend is making the bathtub the focal point of the room. By choosing a large, statement tub and placing it prominently in your bathroom, you’ll draw the eye and attention of anyone who enters. This entry was posted on Friday, January 15th, 2016 at 3:29 pm. Both comments and pings are currently closed.